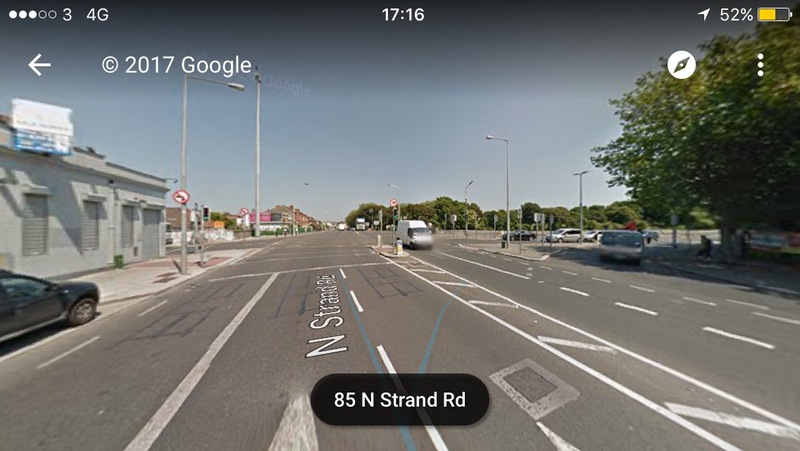 We’ve already looked at (1) the route between Amiens Street at Connolly Station to the Five Lamps and (2) the section between Five Lamps and the junction before Fairview, and now we’re looking at from that junction to the Malahide Road junction. The junction mentioned above is where North Strand and the Annesley Bridge (over the river Tolka) meet with East Wall Road and Poplar Row. Cycling gets no protection from motorists turning left over the main cycle route flow, and a slip turn is maintained when guidance says it should be turned into a turning lane. No cycling provision is made for turning onto or coming off East Wall Road or Poplar Row — that includes no cycle paths/lanes, and not even turning pockets to allow “go left to turn right” movements across the junction. Pedestrian crossings are missing on one leg of the crossing and staggered crossings are retailed on another — both of these design points are against guidance. As was common in the last section we covered, the above image shows another stop-start bit of segregation — the lightly segregated cycle paths (orange) only go a shot distance in any direction before being turned to cycle lanes (red). The surface marked with a tanned coloured to the bottom centra of the image is a new/upgraded shared path along the Tolka to the other side of Fairview Park, to East Point Business Park. We will look at this in more detail later. 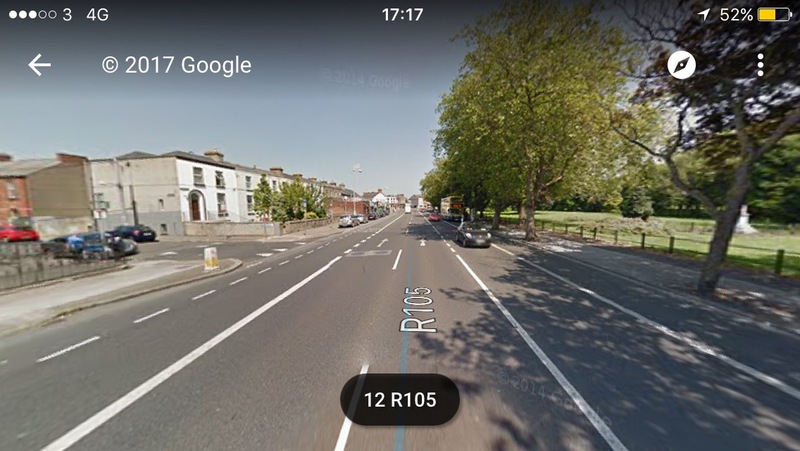 The cycle tracks / lanes here are wide enough compared to most in Dublin but this already a busy cycle route which is likely to get busier (even with improvements which aren’t the best design). 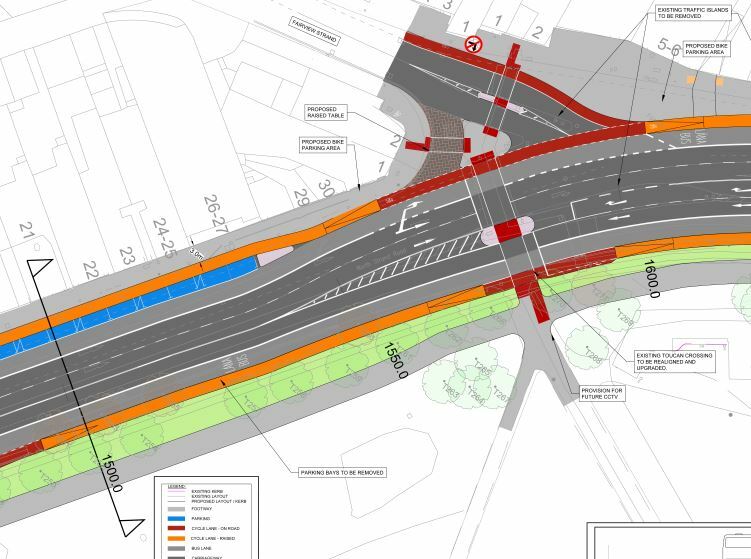 A two-way segregated cycle path on the east side of the road would create a wider effective width for cycling in both directions, more solid segregation between buses and cycling, and overtaking without leaving the cycle path. Above we see yet more stop-start segregation with bus bays interrupting the cycle route in both directions. 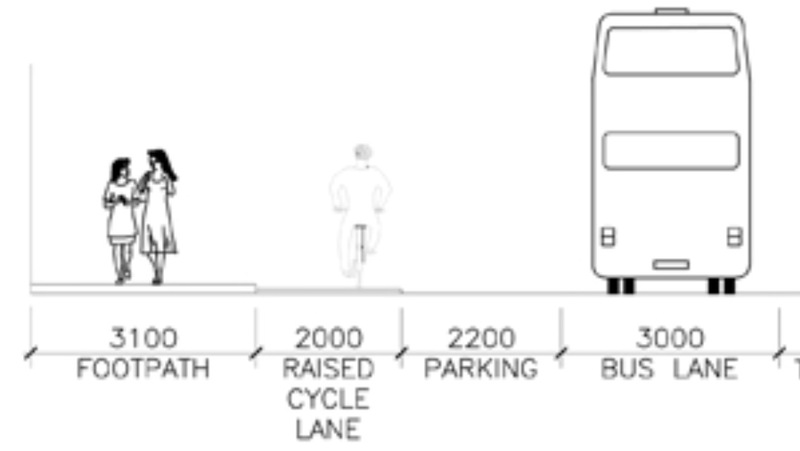 This cross section shows, there’s loads of space in the park for two-way cycle path with a green buffer between the cycle path and the bus lane — and it should be noting that the cross section only shows a fraction of the park. Experience shows that the planned shared walking and cycling path in the park is a bad idea on a commuter route — it causes conflict and is needless. When a car is parked in the parking space above the (faded) cyclist pictured is in the “door” zone. The width of 2 metres might sound wide but it’s just above the minimum allowed under the National Cycle Manual. But the manual does not follow international best practice in looking for a strip of buffer space to separate the cycle track to allow car users to get in/out of their doors without having to interact with cyclists straight away. Generally speaking the lack of buffer space guidance in the manual is a weak point in the guidance. 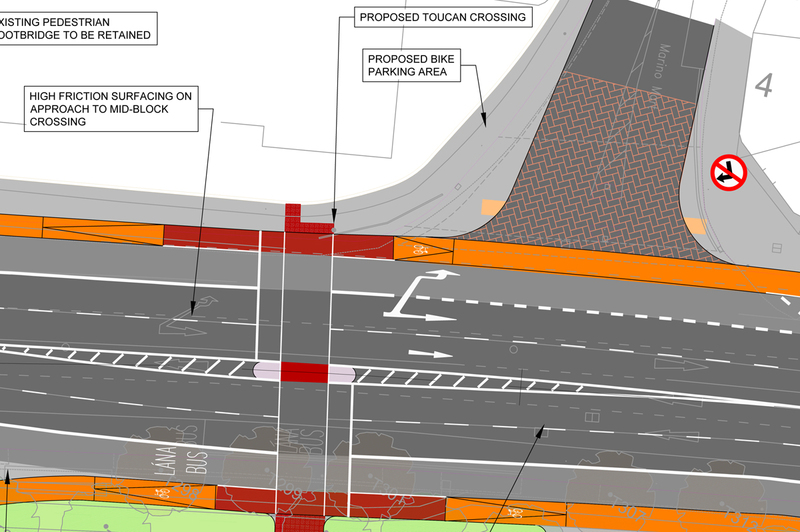 For example, when there’s space to provide a green buffer between a cycle route and a bus lane on a wide road, why would you not provide it? 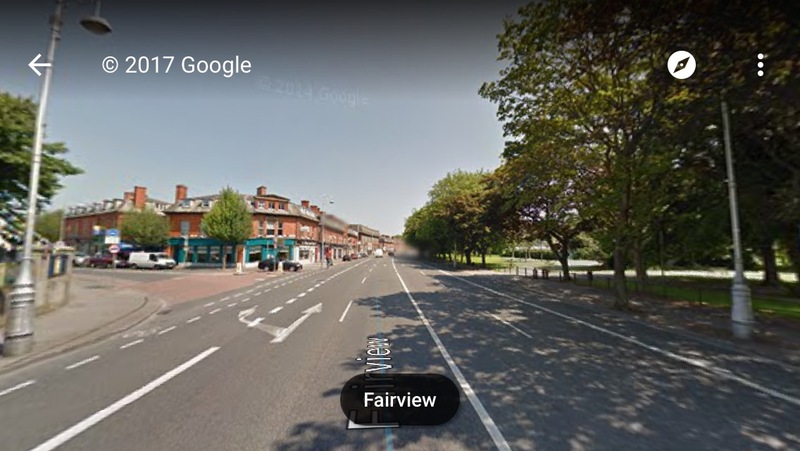 In the above drawing, the only way to turn from the main cycle route right into Fairview Strand is to mix with walking and use the shared crossing. This is besides ample space for a separate cycling crossing? The junction into Fairview Strand includes staggered crossings and a slip turn — again, against guidance. 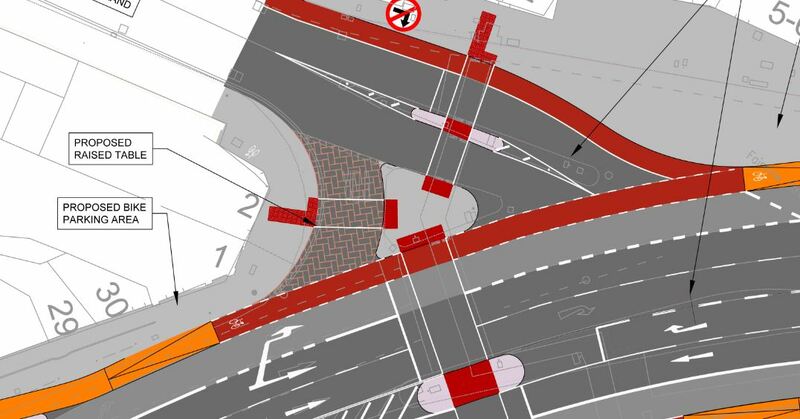 The outbound turn off Fairview Strand is strangely designed as a cycle lane (red) when it goes into a segregated cycle track (orange) on the main road. 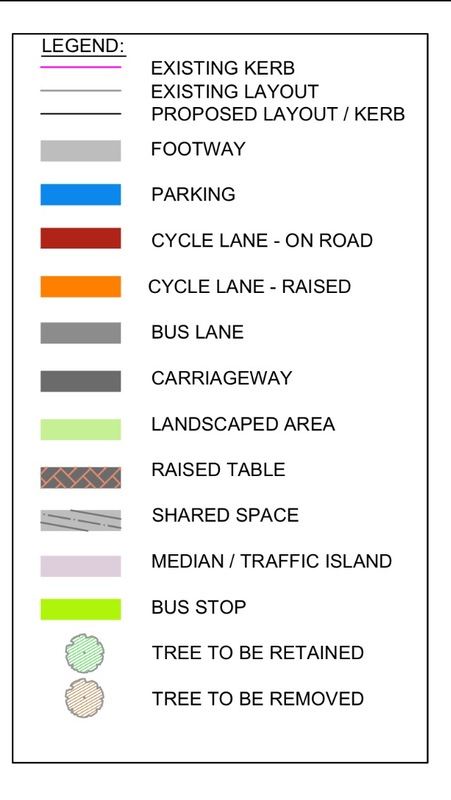 We have added a light blue highlighting line here to show the possible route of a car or truck over the cycle lane. 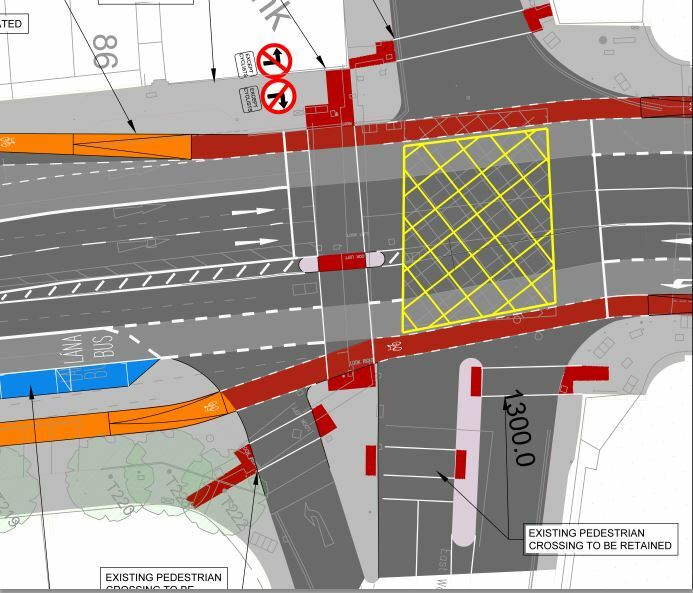 This is poor design which does not account for human error — even if the design is within the Cycle Manual, its poor design and the manual is poor on segregation details especially at junctions. The footbridge which had previously been set for removal is now going to be retained — we’re not getting into the debate on that issue but note how the cycle track under the footbridge is narrow while there’s loads of space in the park for a fully segregated two-way cycle path and instead that’s marked as shared space. 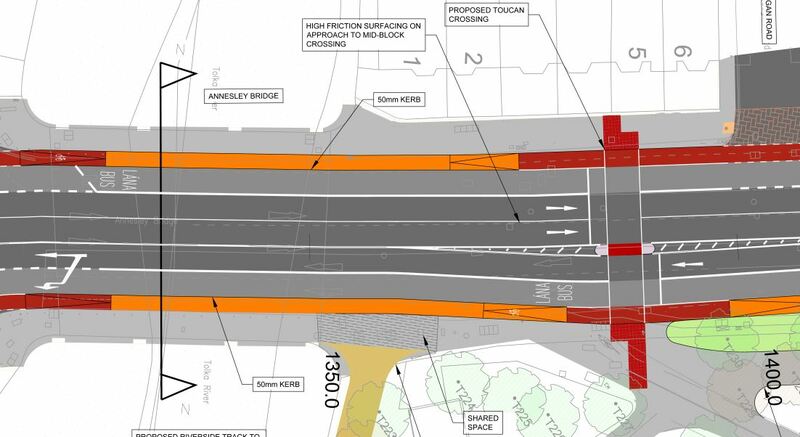 We’d suggest a segregated two-way cycle path in the park and with-flow cycle lane / track on the retail / residential side, but at the footbridge it could possibly go around the footbridge. The above image shows a crossing from the park side over to a side street with a school on it. Regardless of any Irish guidance, this simply is poor design. The mixing of cycling and walking on a crossing is poor to start with but the placement of the crossing also makes no sense on a narrow footpath when just metres away is a wide section of pavement. Also the mouth of the side street is narrowed here but, compared to the outline of the parking space shown (it’s the width of 4+ parked cars), it still looks wide for a minor side street and a location outside a school. 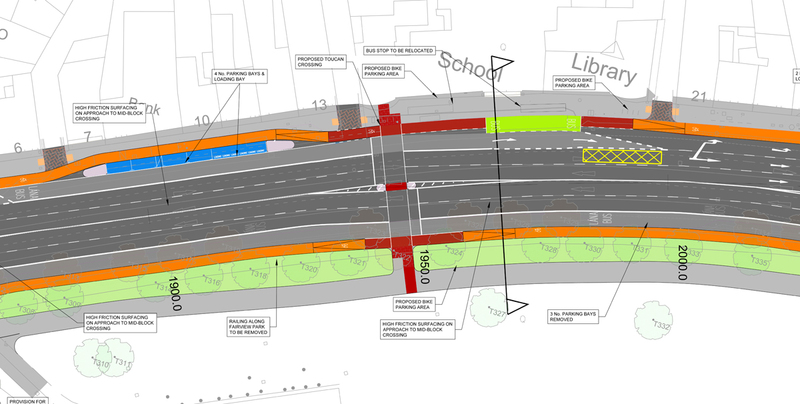 On this drawing we have more start-stop segregation — this time mixing buses and cycling right outside a school.